It’s not easy to buy groceries if you live on the north side of Tulsa, Okla. This predominantly African American part of the city sprawls for miles and yet does not have a single, full-service grocery store. For many of North Tulsa’s residents this means their best option for buying groceries close to home (and really, their only option) is a dollar store. There are dozens of those. Dollar General, together with Family Dollar and Dollar Tree, which are owned by the same company, have more than 50 locations in Tulsa. Many are on the city’s north side. Alongside aisles lined with clothing and household goods, these small stores offer a narrow selection of processed foods, such as canned peaches and cereal, cookies and frozen waffles. There are no fresh vegetables, fruits, or meats in most dollar stores. And yet, as limited as their offerings are, dollar stores are now feeding more Americans than Whole Foods is, and they’re multiplying rapidly. 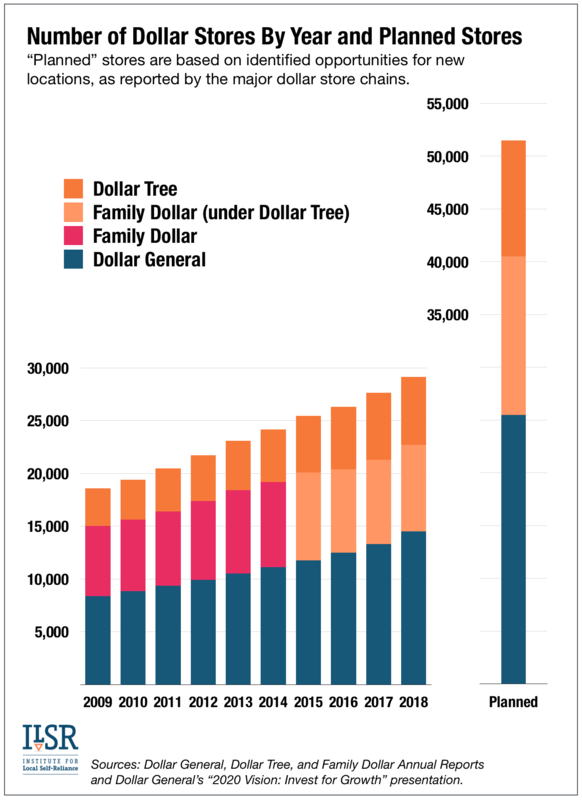 Since 2011, the number of dollar stores nationwide has climbed from about 20,000 to nearly 30,000. There are now more dollar stores than Walmart and McDonalds locations combined. 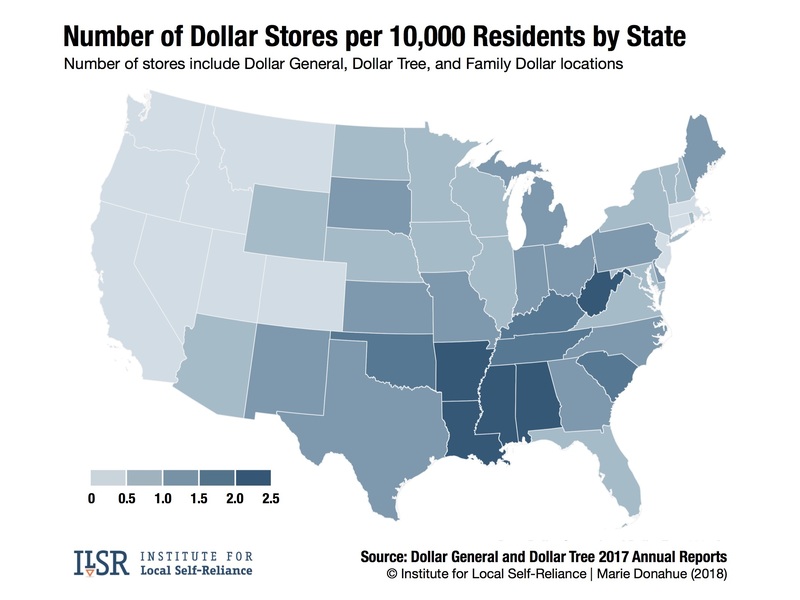 Although dollar stores sometimes fill a need in places that lack basic retail services, there’s growing evidence that these stores are not merely a byproduct of economic distress. They’re a cause of it. In small towns and urban neighborhoods alike, dollar stores are leading full-service grocery stores to close. And their strategy of saturating communities with multiple outlets is making it impossible for new grocers and other local businesses to take root and grow. 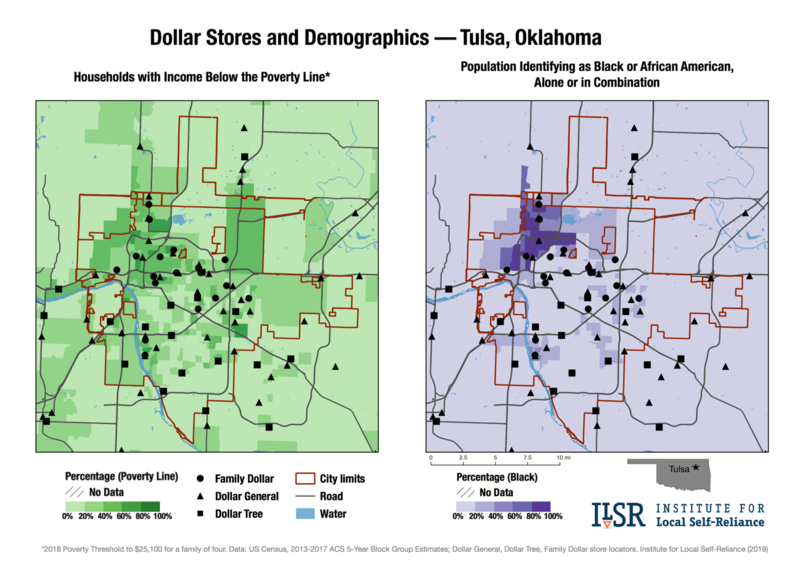 As our maps of Tulsa show, dollar stores have largely side-stepped the city’s more affluent, white neighborhoods, instead concentrating in Census tracts with both a greater percentage of households living in poverty and more African American residents. Indeed, the presence of dollar stores appears to correlate with both income and race. One reason for this link might be that dollar stores see an easier revenue stream in places that lack competing grocery stores. 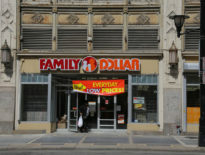 In the case of Family Dollar, for example, “’Food deserts’ are its sweet spot,” notes Ann Natunewicz, an analyst at Colliers International. The absence of grocery stores is, in turn, a direct result of a history of racial discrimination by banks that have been less likely to lend to African American entrepreneurs and by supermarket chains that have tended to bypass black neighborhoods. A deep desire to change these systems and improve the health of people in her district drove Hall-Harper’s decision to run for Council. Last April, after more than a year of rallying community members, marshaling legal research, and steadily chipping away at the opposition, Hall-Harper finally convinced the City Council to enact a measure that limits dollar stores on Tulsa’s north side and encourages the development of full-service grocery stores. This is one of the first ordinances in the country to specifically target dollar stores, and its passage is being felt both locally and nationally. It’s marked a new era of political inclusion and grassroots power for the city’s African American residents. It’s also focused national attention on the growth of dollar stores and inspired other cities and towns to take steps to check their spread. The timing for such local action could not be more urgent. 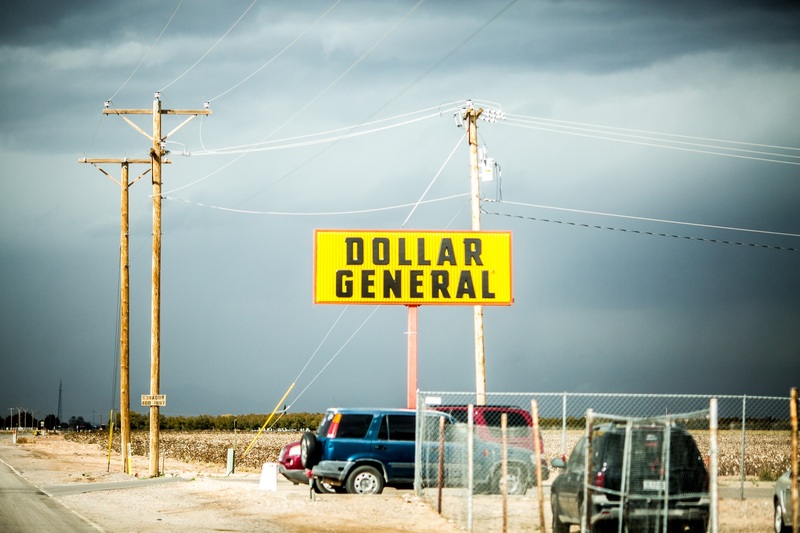 In their latest annual reports, Dollar General and Dollar Tree say they have identified thousands of new locations for dollar stores. The two chains are planning to expand their combined empires to more 50,000 outlets. Alongside urban black neighborhoods, another place the dollar chains think they will find enduring poverty is rural America. Small towns have been battered by corporate consolidation. Mergers have triggered plant closures. Agribusiness giants have slashed farmers’ incomes. As a result, rural communities have experienced little in the way of new business and job growth during the current economic recovery, new data show. Local grocers that survived Walmart are now falling to Dollar General. “This has become the number one challenge of grocery stores,” says David Procter, an expert on community development and director of the Rural Grocery Initiative at Kansas State University. Until this year, the small town of Moville, Iowa, had managed to defy the odds. The nearest Walmart is nearly 20 miles away and residents are passionate about supporting their community. When the owners of the town’s only grocery store, Country Foods, decided not to rebuild after a devastating fire in 2008, residents quickly organized. They raised funds for a new building and enticed Chet Davis, who owns a grocery store in Kingsley, about 12 miles up the road, to open another location. For a time, Chet’s Foods did a good business from its crisp new building along the state highway that runs through town. Then, in 2016, Dollar General opened. Sales at Chet’s Foods fell by 30 percent. Davis, a veteran grocer, tried to adjust. He cut staff hours, changed his product mix, and negotiated a rent reduction from the community development group that owns the building. But it wasn’t enough. Even though residents were still buying most of their groceries from Chet’s, the drop in sales was enough to push the store into the red. Chet’s closed this year. The stories of Chet’s Foods and the Haven Foodliner are not anomalies. Reports from local grocers in numerous communities suggest that it’s typical for sales to drop by about 30 percent after a Dollar General opens. Thin margins in the grocery business mean that such a disruption is generally enough to force a local grocery store to close, although it may take months or even years before the owner finally gives in. If you like this report, be sure to sign up for the monthly Hometown Advantage newsletter for our latest reporting and research. As a consequence, local grocery stores, which have anchored small town economies for generations, are fast becoming as rare in rural areas as they are in North Tulsa. One immediate effect is a decline in employment. Dollar chains rely on a lean labor model. Dollar General and Dollar Tree stores have a staff of eight or nine people on average, according to their annual reports. 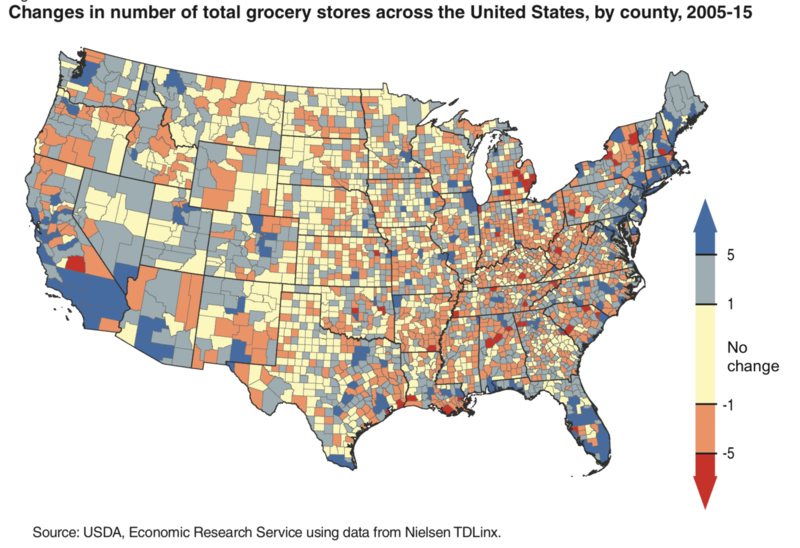 Small independent grocery stores employ an average of 14 people, according to federal data. Local shoppers lose nearby access to fresh food and they may also end up paying more for groceries. Dollar stores package many of their products in smaller quantities than items sold at traditional grocery stores. This cuts sticker prices, but often results in a higher costs per ounce. There are broader economic impacts too. “The economy is continuing to create more of our core customer,” Dollar General chief executive Todd Vasos told investors last year. “Rural grocers provide all kinds of value: economic value, nutritional value, social value, and more,” he adds. In many cases, this includes delivering groceries, a critical service in rural areas, where the population tends to be older and not served by public transit. This cascade of losses is a bitter outcome for communities that, in many cases, welcomed the arrival of a dollar store. “For many communities, it’s the first new commercial investment in many years,” says Chris Merritt of the Illinois Institute for Rural Affairs. The parallel between these rural towns and urban neighborhoods like North Tulsa suggests that America’s real divide is not so much rural versus urban. Rather, it’s between the few large and mostly coastal cities that are prospering in an economy increasingly dominated by a few corporate giants and the many other cities and regions that are being left behind. Fortunately, some have started connecting all of these dots and are beginning to see dollar stores as both a symptom of larger economic trends and a cause of additional economic despair. With this knowledge, these communities are identifying strategies to control the growth of dollar stores and restore a more balanced local economy. One way to understand the high density of dollar stores in her district, Hall-Harper says, is to remember what happened in North Tulsa a century ago. The neighborhood once boasted one of the nation’s most successful African American business districts, nicknamed “Black Wall Street.” But over the course of a few days in 1921, a white mob tore through the commercial district, destroying more than 1,000 buildings and leaving 300 people dead. The long-term effects of this are still being felt today. 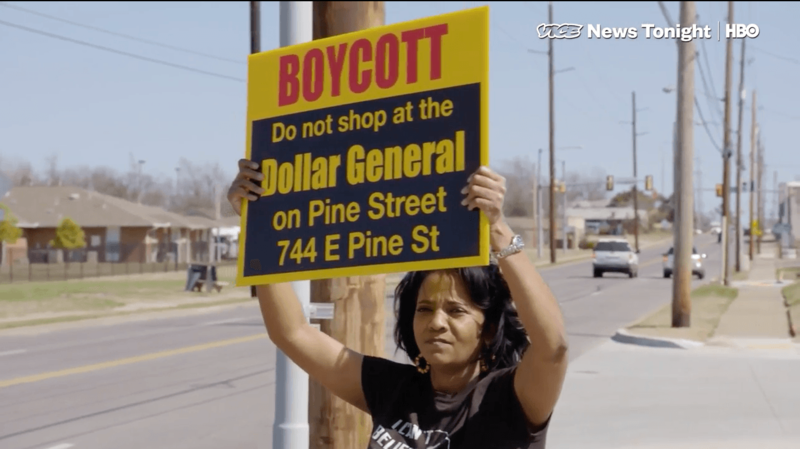 The neighborhood has relatively few local businesses and has struggled with a lack of political power to control dollar stores and other predatory companies. Today, though, these dynamics are starting to shift, as residents organize and show how policy change that rebuilds a healthy food system and local business community can underpin the broader goals of social and economic justice. After taking office, Hall-Harper opened two fronts in her campaign to address the lack of healthy food and proliferation of dollar stores in North Tulsa. First, she started researching policy tools, such as “formula” business restrictions, that could block new dollar stores and open opportunities for full-service grocery stores instead. In the spring of 2017, she called for a short-term moratorium on new building permits for dollar stores. Pressing the pause button, she explained, would give the city time to craft a permanent policy. But the city’s legal department, Hall-Harper says, was slow in doing the research and preparing language for the moratorium. In the meantime, a developer filed plans for yet another Dollar General in the neighborhood, this one just down the block from an existing Family Dollar. “I felt [the city was] procrastinating, so the developer could get a building permit,” she says. That led Hall-Harper to open a second front in her campaign: she rallied residents to protest the new Dollar General and pressure the mayor and City Council to act. “To my knowledge, this was probably one of the first times a city councilor from Tulsa was out actively organizing and coordinating protests of an incoming business,” says Hall-Harper. This inside-outside strategy paid off. Hall-Harper joins Dollar General protest. Photo Credit: Vice News, 2018. While other cities have adopted more aggressive limits on chain retailers, Hall-Harper’s measure was one of the first to specifically target dollar stores. And in Tulsa, it was a reach. The city has long favored a permissive approach to development, even going so far as to use its powers of eminent domain to seize land for developers over the objections of residents. “We kept pushing,” says Hall-Harper of the neighborhood’s campaign. That pushing paid off. In April 2018, Tulsa’s Healthy Neighborhood Overlay ordinance passed the City Council on a 5-2 vote and was signed by the mayor. Now Hall-Harper and the community’s organizing is paying off in another way. “We’ll [soon] have a groundbreaking of a new grocery store,” she explains. That new store is being developed through a project led by the Tulsa Economic Development Corporation (TEDC) in partnership with the City of Tulsa. Aiming to “eliminate food deserts in Tulsa’s most distressed communities,” TEDC has raised $3 million from federal block grants and other sources to build a 15,000-square-foot grocery store in North Tulsa. Once a store operator is selected in early 2019, construction of the store will begin, with the aim of opening by the end of the year. A local architecture firm is already drawing up designs for the building, based on input from residents. “The community wants an aesthetically pleasing store, something they can take ownership of,” explains Hall-Harper. For Hall-Harper, though, this single victory is just the first step. “One grocery store isn’t enough,” she points out. There is no shortage of ideas, from helping local entrepreneurs open food stores to supporting new models like mobile grocery trucks. “Reaching every citizen is how I’ll know we were successful,” she says. That long-term vision, though, hinges on the ability of new food stores to carve out enough market share to survive, and that’s far from guaranteed. “The proliferation of dollar stores certainly has made that a challenge to overcome,” says Hall-Harper. The dollar chains have been able to multiply virtually unimpeded because most communities have relatively lax planning and zoning policies. Even in Vermont, where big-box retailers must navigate a thicket of environmental and land use policies, dollar stores, by virtue of being relatively small in size, rarely face permitting hurdles or scrutiny by planning boards under current policies. As the story of Tulsa illustrates, some communities are beginning to correct this. In addition to limiting the density of dollar stores, as Tulsa did, another option for cities is to adopt a policy that restricts “formula” businesses — those that follow a cookie-cutter format. Used in dozens of small towns and cities, including San Francisco and Jersey City, N.J., formula businesses policies offer a way to limit chain stores or require that they meet certain conditions to open. These measures typically cover all types of retailers, including dollar stores. Motivated in part by increased development pressure from dollar stores, Mendocino County, Calif., passed a formula business policy in 2016. The measure, which covers unincorporated areas of the county that are outside municipal boundaries, requires chain stores to seek a special permit in order to open. The permit application involves a public hearing, and county staff then review the application based on whether the proposed formula business would fit the community’s character. The idea is not to stop all development, but to establish a process for weighing the merits of particular projects. Another key to winning, Hall-Harper says, is community engagement. “I honestly believe we wouldn’t have been successful if the community didn’t come out,” she notes. 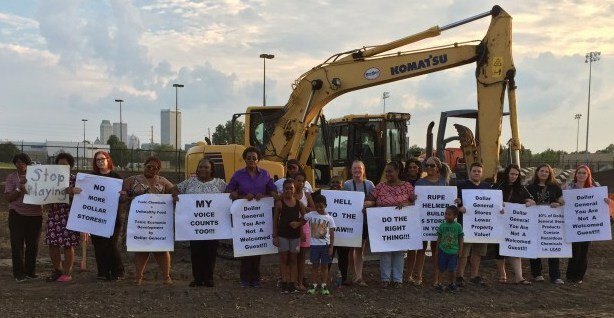 Residents protest dollar store development in North Tulsa, Okla. Photo Credit: Black Wall Street Times, 2017. Already some cities are moving to replicate Tulsa’s success. In Mesquite, Texas, which saw 15 new dollar stores built over the course of a decade, the city consulted with Hall-Harper and ultimately passed a similar dollar store “dispersal” ordinance. In New Orleans, several city council members have recognized dollar stores as a problem. Similar to Tulsa, they’ve seen these stores concentrate in particular neighborhoods. In 2018, New Orleans City Council passed a motion directing the city’s planning commission to conduct a study to help “classify, define and regulate” dollar stores. Along with this “Small Box Retail Diversity Study,” finalized in December, the commission has scheduled public hearings and invited public comments. Cities and states can also take steps to actively support the development of local grocery stores, just as Tulsa is doing with TEDC’s new grocery store. One of the biggest barriers entrepreneurs face in starting new grocery stores is securing a business loan. The Pennsylvania Fresh Food Financing Initiative has shown how to solve this problem. Through loans made over the course of about a decade, it has facilitated the opening and expansion of more than 80 local food stores in underserved cities and towns across the state. As these policy examples illustrate, communities are not at the mercy of the dollar chains and their plans to blanket both rural and urban America with thousands of new stores. By blocking the spread of dollar stores and fostering the growth of local grocers, cities and towns can begin to close the gap in access to fresh food while also building local power and opportunity. Correction: The map in the story has been updated to correct errors in the original that misrepresented the distribution of African Americans in Tulsa. Additionally, this story has been updated to reflect new information about the grocery store being developed in North Tulsa and add details about Dollar Tree’s acquisition of Family Dollar.